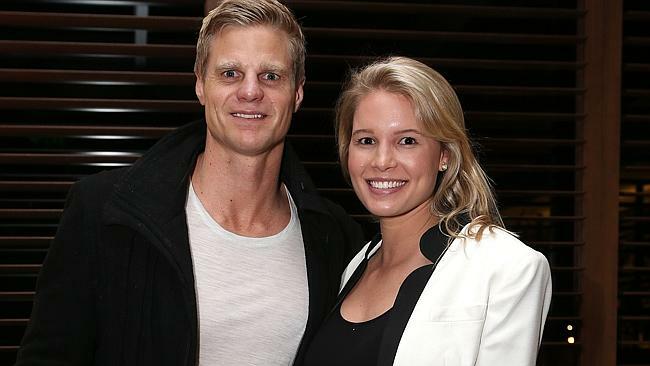 AFL star Nick Riewoldt, and his wife Catherine, welcomed their first child on December 4 and have named their son James Lawrence. Nick is the captain of St Kilda, where he has played since 2001, and has won the Leigh Matthews Trophy for most valuable player, and the Ron Evans “rising star” medal. Nick and Catherine were married in 2012; the wedding was at Catherine’s parents’ cattle ranch in Waco, Texas. Retired AFL star Wayne Carey, and his partner Stephanie Edwards, welcomed their daughter Charlotte on November 21, born prematurely and still in hospital although healthy and making good progress. Wayne also has an 8 year old daughter named Ella with his ex-wife, Sally. Wayne played for the North Melbourne Kangaroos from 1989-2001, and became the club’s captain. After an off-field scandal and time away from the game, he played for two seasons with the Adelaide Crows before retiring in 2004. He is often regarded as the greatest player in the history of the game, and has won the Michael Tuck Medal for fairest and best, and the Leigh Matthew Trophy twice. Wayne is currently a football commentator for Channel 7 and Triple M radio. Rugby league player Dean Whare, and his wife Natasha, welcomed their daughter Zahlia last month, a sister for Mia, aged 2. Dean is originally from New Zealand and plays for the Penrith Panthers, as well as for the New Zealand national squad. Zahlia arrived just before the Four Nations final, where New Zealand beat Australia 22-18, so it was a very good week for Dean. Retired AFL star Lenny Hayes, and his wife Tara, welcomed their son Hunter last year. Lenny was captain of St Kilda, which he played for from 1999-2014. He won the Norm Smith Medal in 2010 as best player at that year’s Grand Final, and was awarded the Madden Medal for lifetime achievement this year. Since retiring, Lenny has taken up a role as project manager for the AFL, and written his memoirs. Surname pronunciation: Riewoldt is said REE-volt. Australians usually pronounce Whare as FAHR-ay, but apparently it’s really more like Buddy with an F.